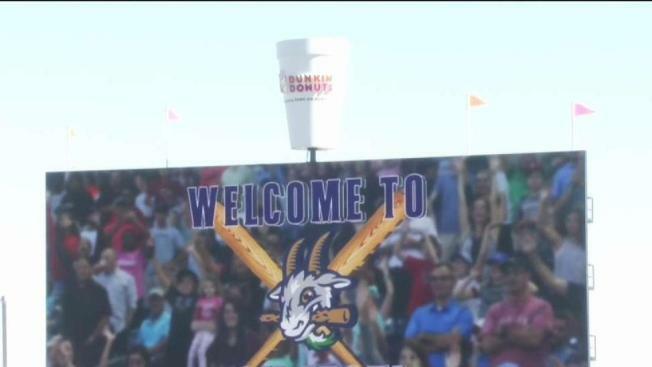 The Hartford Yard Goats are holding their second annual FanFest event at Dunkin' Donuts Park on Saturday. The Hartford Yard Goats held their second annual FanFest event at Dunkin' Donuts Park on Saturday. The free event was open to the public and included behind the scenes tours of Dunkin' Donuts Park and arts and crafts. Yard Goats mascots Chompers and Chew Chew and Fancy Pants the goat from Circle K Farm in East Hampton also made appearances. Fans were able to test out the indoor, climate-controlled, professional batting cages that the Yard Goats use. The Yard Goats collected new and gently used baseball equipment for donation to Capital Preporatory Magnet School. Anyone who donated received 10 percent off merchandise in the Retro Brand Team Store on Saturday. The event ran from 12 p.m. until 2 p.m.
NBC Connecticut is the proud media sponsor of the Hartford Yard Goats.